You may start your walk any time from 7am to 11am.Depending on the trail that you take, from 3km to 10km. you can be out in the fresh air for one or two hours or more. Entry fees are $5 per adult (visitor/runner/walker/biker), while children from five to 12 are $2, and there is a $1 per dog charge; senior citizens over 65: no charge. Dogs must be on leashes. Children on mountain bikes very welcome. With an annual (12 month) Woodland Walker membership ($50 single, $80 double, $120 per family, including children and dogs!) you can walk on any weekend at no further charge. Get more details when you book in with our reception staff. Food is placed for the animals at the Viewing Platform around 10am – see eland, zebra, giraffe and impala; guinea fowl, Egyptian geese, grey heron and more. Advice for walkers: best to wear a hat and take some water with you. You can buy bottled water before you start. The trails take you near the bird hide and small dam and then into the wild game area. Visitors with dogs must ensure their dogs are firmly secured and leashed. Having dogs on the leash is not only for the protection of your dog, but to stop them disturbing our wild animals. Anyone letting their dog off the lead in the wild game area will be banned from The Woodlands. 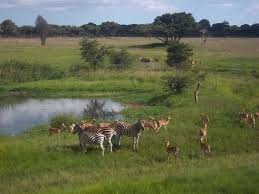 Mukuvisi Woodlands is 5km from centre of Harare on Glenara Avenue/Hillside Road. Call (+263 4) 747111/123 or (+263 774) 198009.